With a few holes to fill in our new book Robert Clark and I headed to western South Carolina Wednesday, May 29. We went directly to Lincolnton where we used sister Brenda’s home as a base camp. After a visit with my mom we set out for McCormick. As soon as we turned off Highway 220 onto 378 the sky turned a menacing yellow. Soon the smell of burning woods filled the car and Robert spotted a cloud a bit different from the rest. “There’s the fire,” he said, pointing slightly northeast. A yellow plume of concentrated wood smoke ascended. As we crossed the Fortson-Dorn Bridge it occurred to me that photography under these conditions wouldn’t be possible. It was just the opposite. Robert said the smoke would make the sunset spectacular, rife with color. In McCormick we checked with the folks at the Chamber of Commerce. We were looking for a way to get into the old Dorn Grist Mill. Anne Barron, director, and Dot Bandy greeted us and soon Dot led Robert and me through the mill. Right away I noticed a boiler made by the Lombard Iron Works of Augusta. That boiler powered this attrition mill where grinding plates revolved in opposite direction at 2,200 revolutions per minute. When this mill was up and running the din must have been unbelievable. All was quiet. All the great machinery, gears, wheels, and cogs were stilled by the hand of time. Ann Barron said the mill still works. All it needs is someone to run it. Whether it runs or not, it’s a charmer. 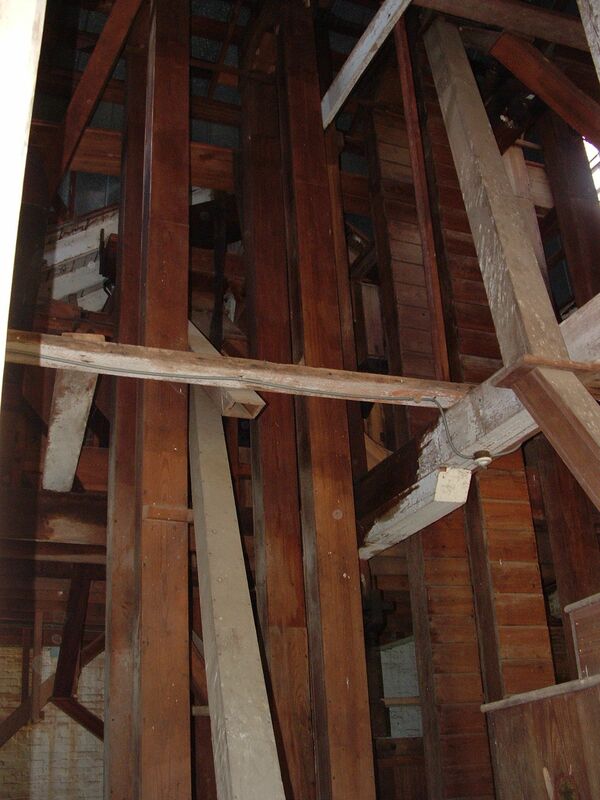 A beautiful aspect of the old mill is its many hues of wood. Beams chutes, and railings were blond, red, and tan, and the thick brick walls, which support all things wooden had the place much cooler than I expected. Beautiful too is the Silver Creek Flour Packer. I’m guessing it funneled flour into bags thereby packing them and earning its name. Manufactured by the S. Howes Company Eureka Works it came from Silver Creek, New York. Silver Creek Flour Packer indeed. What impressed me most was the building itself. Viewed from the front it has a medieval look. Listed on the National Register of Historic Places it’s lauded as “an outstanding example of rural industrial architecture. 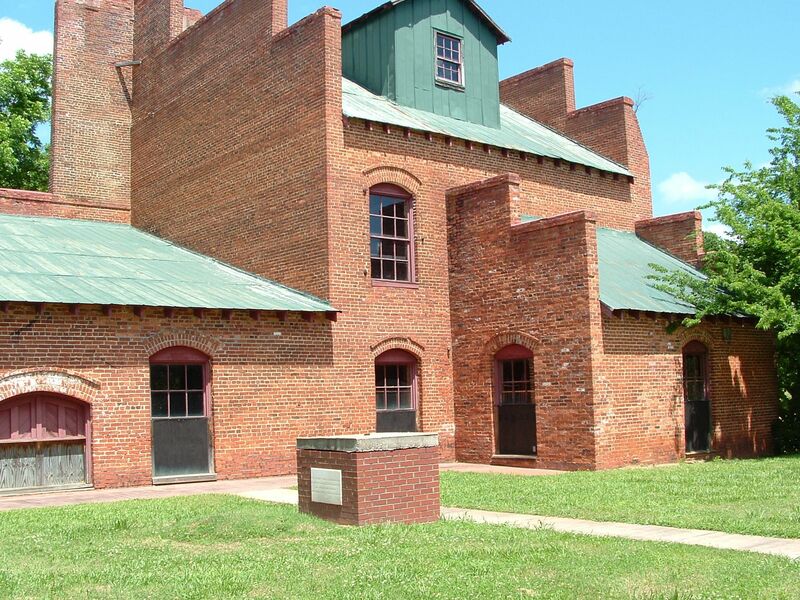 The dominant feature of the exterior is a three-story brick wall of cross-shaped plan built in 1915 to support a water tower tank.” Out front stands a monument of sorts, a low squatty brick structure with a plaque. who donated the site of this building. “Munificence.” A word you don’t come across often, it means more generous than necessary. That afternoon we drove up Highway 28 to Abbeville. We had a 2 o’clock appointment to tour the Burt-Stark home. Ruth Bacon met us at the front steps and we walked into history. You don’t have to go to Gettysburg to see some serious Civil War history. It’s close by. Abbeville is often referred to as the birthplace and deathbed of the Confederacy with good reason. Abbeville’s Burt-Stark Mansion, known also as the Armistead Burt House, is where the last Council of War cabinet members of the Confederate government met. The birth took place at Secession Hill when local citizens gathered November 22, 1860, to adopt the Ordinance of Secession from the Union. A few hundred yards and four and a half years later the Burt-Stark Mansion is where the will to fight left the Confederacy’s leaders. 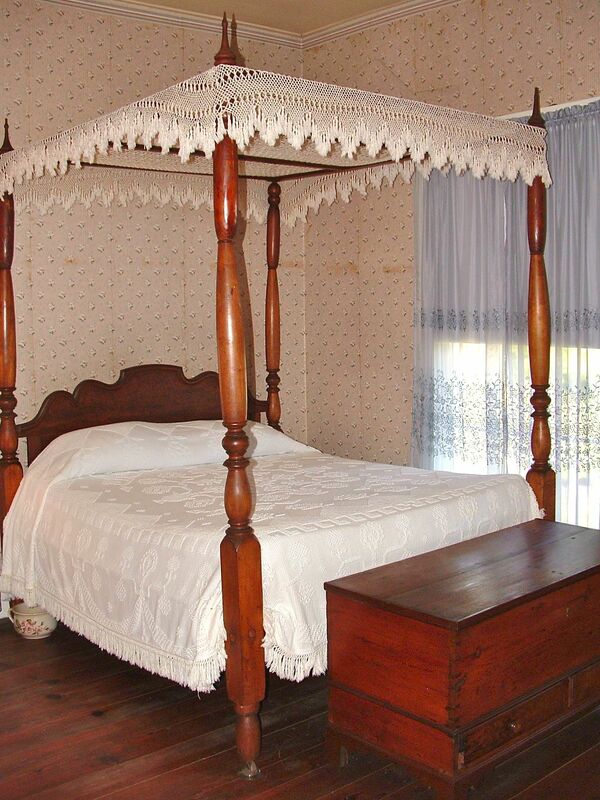 Reportedly a shaken Davis had to be helped upstairs where he rested in a four-poster bed. Contrary to legend Davis did not spend the night here. Making our way toward Mount Carmel we found Highway 823 a backroad if ever there’s one. On this lonesome road we were looking for the Calhoun Mill and we found it not far from a rusting steel bridge over Little River. That old bridge is beguiling. Think of a scene from Fried Green Tomatoes. Just off a side road at the end of the bridge we parked and trudged through a thick field of vetch saturated in lavender blooms. At the far edge of the vetch stood the mill, illuminated by low-angled sunlight. How many men I thought worked away in that old building. Backtracking we went across the bridge and found the dam where the mill got its power. Some locals congregated there were having a good time. They eyed us with suspicion but a friendly young woman who likes writer and “writes poetry” led us down to the riverside. A Chattooga-like setting met us. As we photographed Little River and the old mill dam a man came by with two good-sized channel cats. Fried fish tonight! Back in Mount Carmel, a ghost town, we spotted a picturesque church, picturesque but abandoned. 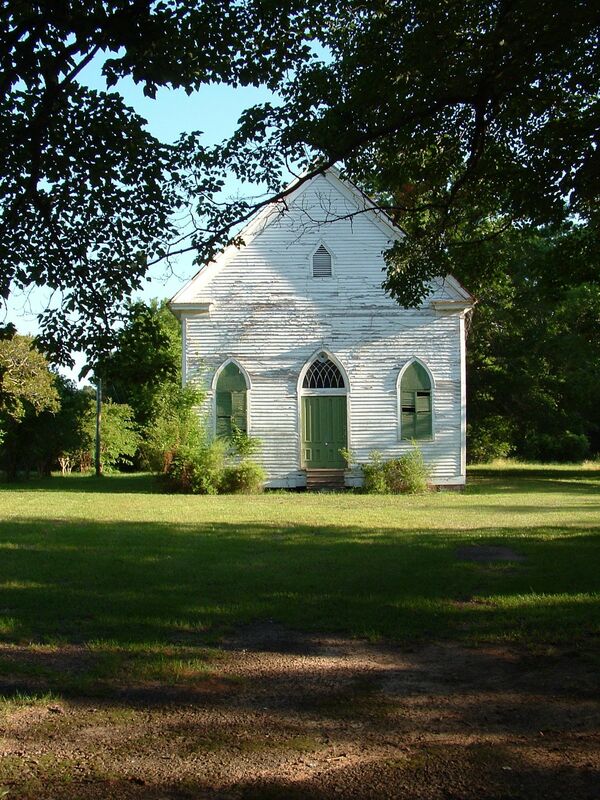 With a simple architecture and elegant lines crisscrossed by vines the Old Mount Carmel Presbyterian Church sits there, its paint peeling away. 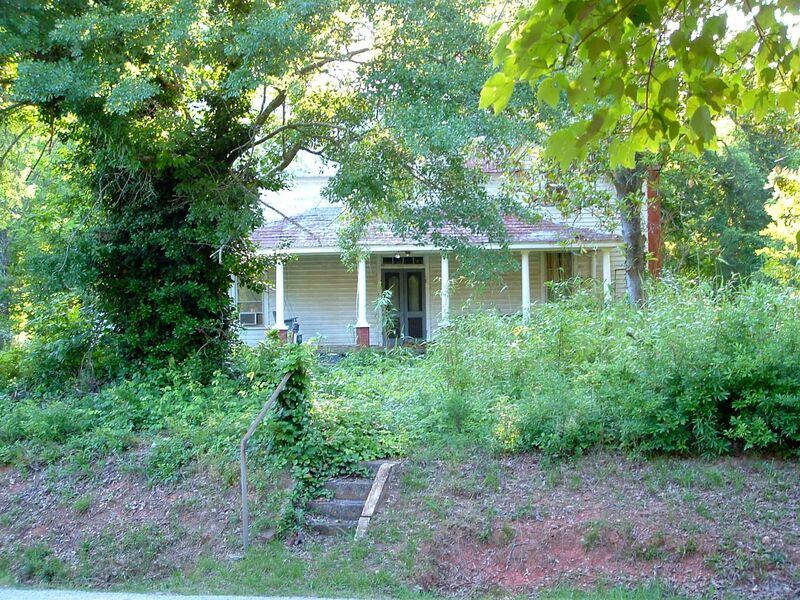 Across the street sits an abandoned home. Easy to conjure up the ghosts of that home drifting through dusk, settling light as feathers on the old worn, forlorn steps. Time stands still here. To say Mount Carmel is an anachronism is an understatement. Something bad went down here. Too many nice homes have surrendered to shrubs and vines. Oh and like bookends another abandoned church stands at the opposite end of Mount Carmel, the Mount Carmel Associate Reform Presbyterian Church. I know that the Savannah River Railroad helped Mount Carmel to prosper in the 1880s but something went wrong. What happened? Well a series of events. In the summer of 1896 fire destroyed a portion of the town. During a burglary a kerosene lamp fell over and four homes and twelve businesses turned to ash. Several businesses were rebuilt, brick this time, and the brick came from D.B. Cade’s brickyard. So the town carried on … for a while. How do you choke the life out of a town? Like this. Some years after 1906 prosperity began to wane. The arrival of the automobile lessened the railroad’s value and folks began to move in quest of jobs. In 1921 the boll weevil infestation devastated Mount Carmel’s cotton-producing areas. The Great Depression arrived and delivered the knockout punch. With the sun dropping fast and my gas gauge hovering right at the E, I drove us out of there. Outside Calhoun Falls we gassed up and made our way home across Lake Russell into Elbert County and down Highway 79 past my mother’s childhood home into Lincolnton. Thursday, early morning. Fog drifts through the pecan orchard across Highway 47. Spider webs heavy with dew speckle the pastures with silver. We drove back into McCormick where Janice Grizzard gave us a tour of Hotel Keturah, circa 1910, a building also on the National Register of Historic Places. In front of the hotel, Janice pointed out six stones sunk into a sloping shoulder of grass just off the rail tracks. Down these “steps” black gentlemen in tuxedoes escorted train passengers to Hotel Keturah. What refinement. What a polished time. Keturah by the way is the name of the wife of W.J. Conner. And who might he be? The man who built not one but two hotels on this site and named them both in his wife’s honor. (The first Hotel Keturah, 1900, burned in 1909.) Janice told us how to find Badwell Cemetery and we struck out again on this whirlwind exploration of a historic land I dismissed most of my life. Hitting 378 again we turned off onto Huguenot Parkway, a road I have no recall of from youth. I don’t know if an old road was renamed or if it was built as part of Savannah Lakes. Well it’s there, that’s for sure. We stayed on it all the way through Savannah Lakes, and soon we spotted a road to the right, Badwell Cemetery. We drove this sandy lane and turning left and driving some more we hit a turnaround where the gleaming white spire of a monument broke through the greenery. We parked near a beech tree where countless souls have carved all manner of sentiment and messages into its aged bark. It looked a bit like hieroglyphics. We found the cemetery down slope near water. Legend says a troll guards Badwell Cemetery. We saw no evidence of a troll but a courageous terrapin met us near the entrance and it never left. Are trolls shapeshifters? Maybe. A rock wall, partially caved in, protects the cemetery or tries to. Thieves made off with the Grim Reaper that adorned the wall enclosure’s iron door but it was recovered and now sits in the South Carolina State Museum. Damn thieves! What a photograph that would have made! I’ll always remember this graveyard but not because notable French Huguenots such as their leader, the Reverend Gene Louis Gibert and members of the Petigru and Alston families, lie here. No, credit for this bittersweet memory goes to the inscription on each side of a four-sided white marble marker. 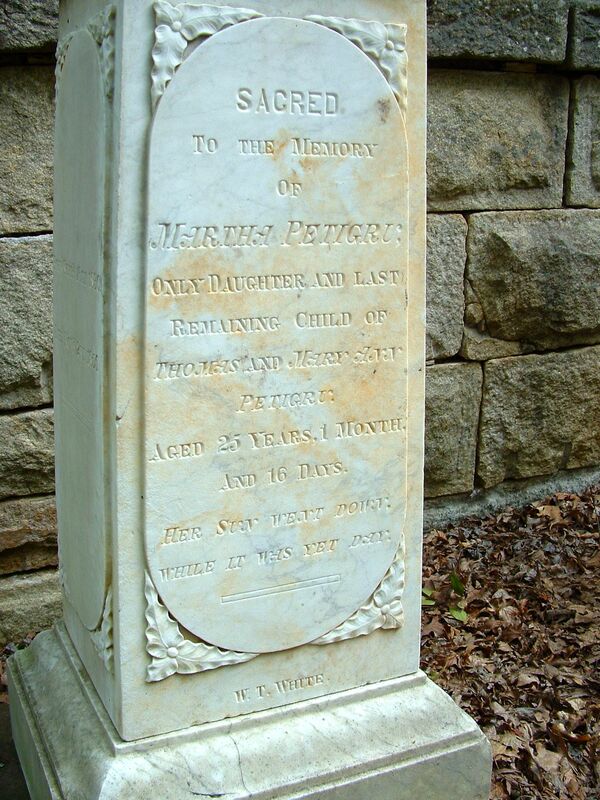 Sacred to the memory of Martha Petigru, Only daughter and last remaining child of Thomas and Mary Lynn Petigru, Aged 25 years, 1 month, and 16 Days. While it was yet day. Be cheered by Him, Who has said. Her sun went down while it was yet day, Jeremiah 15:9. At the base is the name W.T. White of which no amount of research explained. 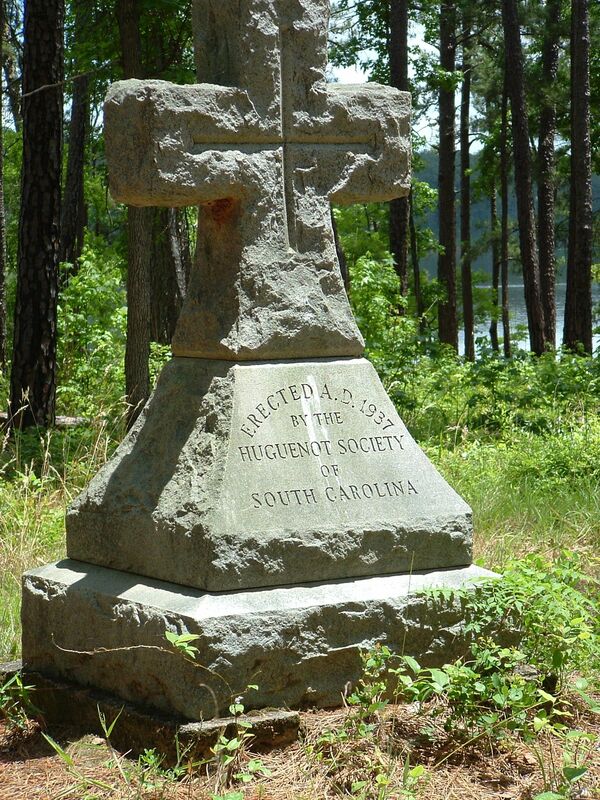 With a ringing mandolin and Steve Earle’s “Copperhead Road” booming in my head, we set out looking for a memorial to the site of a Huguenot place of worship. On we drove down this graveled road far from the city. And then we turned onto a dirt road with a strip of grass in the center. On we drove and then we saw it, a Maltese cross that marks the spot of the New Bordeaux Huguenot place of worship. New Bordeaux, 1764, was the last of seven French Huguenot colonies founded in South Carolina. The French settlers brought the European model of agriculture here. Fruit trees, olive gardens, and vineyards sprang up. The village prospered in the 1760s and early 1770s, but the Revolutionary War ruined their economy and New Bordeaux faded away. Looking around the cross I saw nothing but pine trees, no river, but the lake instead. Growing up I had heard of Bordeaux, principally that it had a country store that would sell beer to underage Georgia boys and that the owner’s daughter was a looker. Not a trace of that store remains either. I heard it burned long ago. Granite monuments and rock walls though … they endure. I took your advice and did the rainy day read! Very descriptive and informative! Can’t wait for Part 2!